Where did you go…. and what did you eat? This is a slightly different kind of post. If you’ve read it before – I apologize. But I’ve been a little stuck on writing ideas. So… I figured I would catch some people up to date on some of the things that have happened on a social networking site I belong to. The list below came about from completing one of those “check off what you had done” bucket list chain letter thingies. I realized after I had checked off all the “Done Thats”, I had done about 95% of what most people had included on their respective bucket lists. And, I had eaten 100% of what most people thought they would never eat. Submitting my answers to the ethereal inter-verse – I began to think about it. I’ve eaten some really… I mean really odd stuff over the years. I have always believed that when you travel – look for (and try) what the locals are eating. You never really get a complete, rounded picture of what life and culture is like, until you immerse yourself….completely… into the culture of the indigenous people. With that said, below is a short detailing of some of the places I’ve been – and some of the more unusual things I’ve sampled over the years. I thought since there was the Canadian gross breakfast meat – we should have the American counter-part. 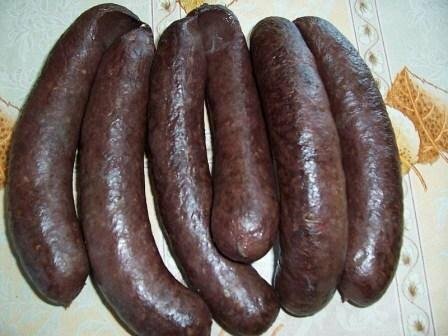 Meat, cornmeal, fat and sausage spices. 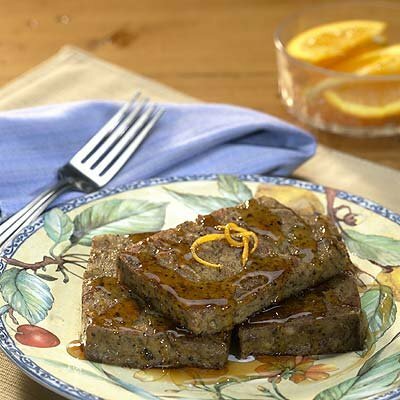 It makes a grey-ish meat loaf that’s sliced up and fried. And, if you’re feeling particularly festive, slather some syrup over it. Okay, we’re not really fooling anyone here with the fancy name… it’s a rat. Decidedly a clean-ish rat, but a rodent just the same. I found a small locals-only kind of place on the outskirts of town that cooked up a tasty version of this. 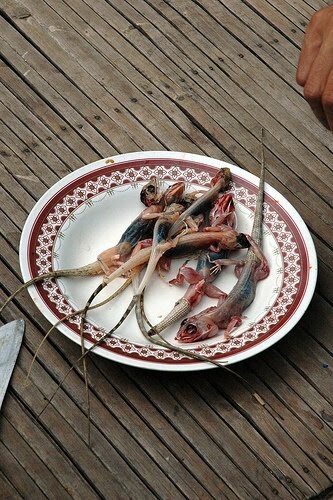 Although it lacked a lot in presentation, (it was served deep fried – spread eagle on the plate…. with a lemon wedge) it was surprisingly edible – as far as non descriptive cooked meat goes. I’m not totally convinced the lemon wedge added anything to the meal. Call ’em rocky mountain oysters, prairie oysters, or calf fries – they’re the same thing. 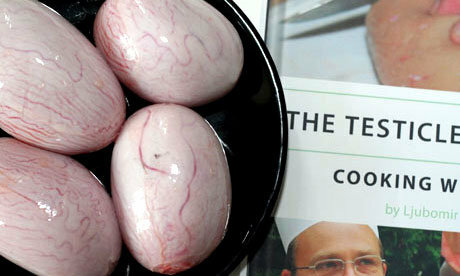 Testicles. I had the opportunity to go to a sheep farm and help out with some of the work for the day. Dinner that evening was a heaping basket of lamb and cow “calf fries”. They’re chewy, and not the worst thing I’ve put in my mouth. 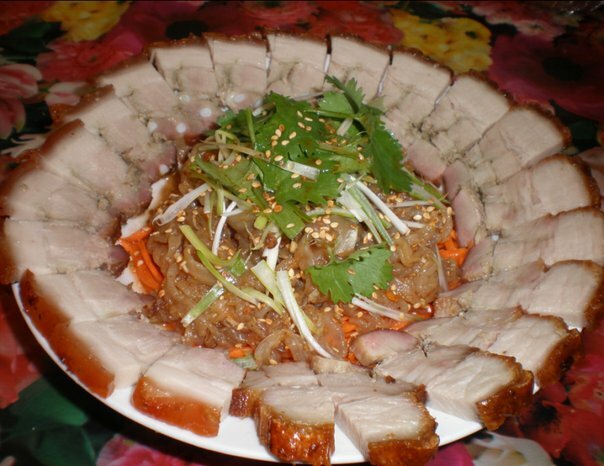 Back when Thai restaurants were first starting to infiltrate the culinary mix in Atlanta, There was a natural learning curve to see just what foods all us Arrogant Americans would be willing to eat – or say, try more than once. I had stopped in to one of those restaurants in the hopes of finding a new favorite. The restaurant had very few Caucasians dining – so that was always a good indicator that this establishment might offer something more than the standard homogenized Thai fare. On the menu was “Tiny White Fish in Seasoning”. Now, I’m a sucker for small food…and a big fan of seafood in general. So I ordered it up. They wouldn’t sell it to me. Fire! Fire! Hot! Hot! was all the waiter would say. and he said it loudly. But, I would not be deprived my tiny little fishes. The owner came over…we explained again that what I wanted was the fish, and he announced that they were Fire! Fire! Hot! Hot! I insisted… no….I just short of demanded, that I wanted them. After a long time of the owner telling me that I would be “happier” ordering something else, he finally agreed to serve them. I went to Cancun back in the very early 80’s. Long before the Yucatan had become just a never ending sea of condos, hotels, and villas. I had read that the locals there ate iguana, and I knew if I found the right contact I would be able to feast on a big lizard. It took the better part of a week to convince my driver that I “really” wanted to eat an iguana. And he was equally diligent not to let me. But a week’s worth of over tipping finally got me the score. We left the flat and headed south to Tulum, then made a sharp right and headed off into the jungle. My driver cautioned me to stay in the jeep if we stopped ( panthers, you know) and try not to stick my hands out of the careening jeep. About 2 hours into the jungle we came on a shack with picnic tables out in a clearing. the resident came out asked the driver how we wanted it.. (dry or juicy) I thought dry would be the better option. She went into the shack and brought out this 2-ft long iguana and proceeded to kill, gut and skin it before us. It was then tied to a stick and thrust into a 55 gallon drum of an unknown boiling oil and deep fried. It was – hmm – kinda like rattlesnake, kinda like alligator, and a lot like iguana. The heavy reptilian smell that lizards have permeated the meat. it was tough-ish, stringy, but all-in-all not horrible… but not terribly good, either. Actually it isn’t bad. Although, in most cases, it isn’t something you want to watch anyone eat. The natural casings are on the tough side – and the filling is on the soft side. Not really the best combination for something you hold in your hand and bite. It tended to ooze and squish thick, dark liquid out. Now there is a process to preparing jellyfish. the stinging things have to be removed and the remainder has to go through a series of pressing – blanching – pickling – pressing – blanching – brining… many times to release the toxins that “sting” and paralyze their prey. The final resulting delicacy is a little like eating tangy, tingly, rubber bands. Its an interesting texture to eat.. The jelly fish crackles and pops a bit as you chew it, and there is a mild numbing sensation on your tongue and throat. Looking at a horseshoe crab, your first impression is that there isn’t a lot to eat there. Its mostly shell and small appendages. And, you know…you are absolutely right in that assumption. 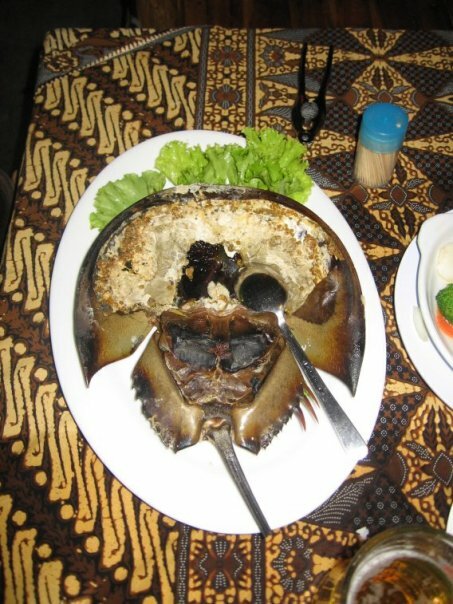 What there is to eat on a horseshoe crab….is the roe and nast. It is brought to the table – whole and legs up. The server then produces a small mallet and proceeds to whack it about the leading edge of the shell and lifts off the “body” . What you are left with is a steaming mass of roe and nast stuck to the inner side of the shell. This, my friends, is scooped up with a spoon and enjoyed. No…it isn’t. It was thoroughly disgusting. 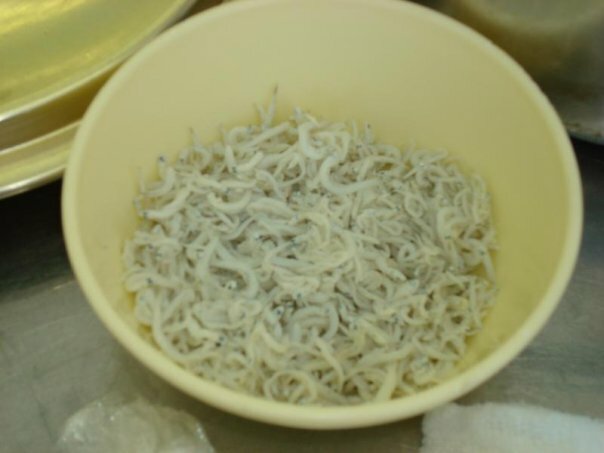 The texture is sticky, mucous y… and the whole thing has that stench of stale fish and seawater about it. There is a little market just off the beach where the locals harvest the sea worms out of the mud flats exposed when the tide rolls out. 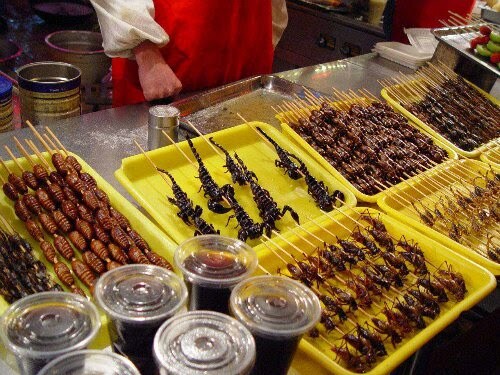 There, you can get small squid, sea horses, octopus, and sea worms cooked in the open air over charcoal braziers, where they all come with a sweet-hot light syrupy sauce over them. Taste wise – they are really quite good. As with most non-fish type items, they do tend to be a little chewy. and knowing what they are, they have a tendency to be very gritty. They also – so it now seems – carry with them a voracious parasite, that ravaged my intestinal tract for the next 3 weeks. Things on a stick seem to be very popular in Asia. Dog on a stick, Squid on a stick, dried fish on a stick, bean paste on a stick. and then there’s grub and scorpions on a stick. Its not bad. Most have a sweetish, nutty flavor and they are well fried (I’m guessing to kill any parasites) But, they aren’t bad. And, if you can get past the ingrained horror most of us have with insects, then some can be quite tasty. 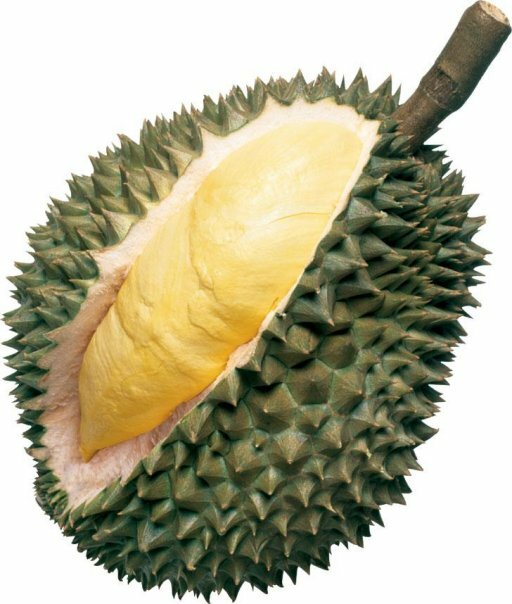 For those that may not know, Durian is a large spiny fruit that is found just about everywhere in Southeast Asia. Usually larger than a football, the outer shell encases 2 to 3 large lobes of bright yellow fleshy fruit. The taste is reminiscent of the same citrus / banana flavor that most Asian fruits oddly have. Durian is incredibly high in vitamin C and Potassium… the juice has be known to cause mouth sores. That, is the upside of the fruit. The downside is two fold. 1. Durian emits an odor…so much so that there are notices and warnings posted all over the city in almost every public area forbidding you to bring in a durian. How bad can it be? Richard Attemborough once described the odor as “an open sewer with a top note of coal gas.” Yes, its bad. 2. Texture – as I said, the meat is fleshy and in a ripe durian, its raw chicken kind of fleshy – wiggly, slick, with an unsettling weight to it. In addition, the juice has a cloyingly sweet taste and a chalkiness about it that make it nearly unpalatable.